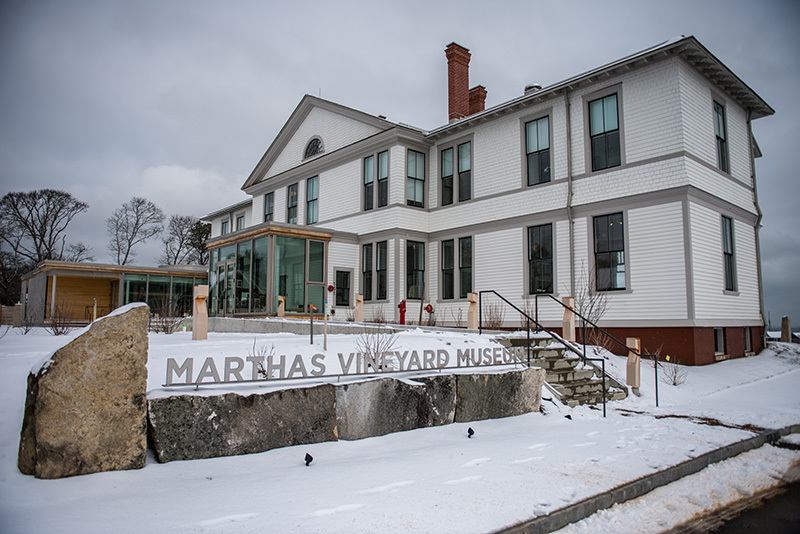 After months of planning, packing, moving, and renovating, the Martha’s Vineyard Museum is set to open its doors to the public in Vineyard Haven. Museum members are invited to an exclusive preview night Tuesday, March 12, from 5 pm to 8 pm. The museum will then open to the general public on Wednesday, March 13, at 10 am. The museum’s new campus, is inside the former Marine Hospital, which overlooks Vineyard Haven Harbor at 151 Lagoon Pond Road. The new space includes 14 exhibition spaces, a classroom, program room, research library, gift shop, and café. The 1854 Fresnel lens from the Gay Head Light, one of the museum’s biggest attractions, will be on display at the museum glass pavilion. A large hall will also house many of the museum’s larger objects. Visitors can look forward to the museum’s rotating and permanent exhibitions. “Our Own Beat: 200 Years of Island Music,” which explores the Island’s musical moments over the past 200 years; “Hidden Treasures: Selections from the Permanent Collection,” which gives visitors a closer look at items that have been stored out of sight for years; and “Lost and Found,” which showcases five artists who captured the Marine Hospital after the museum purchased the building. A full list of the new temporary exhibitions can be found at bit.ly/mvmuseumx. The museum will be open year-round Tuesday through Sunday. March through May hours will be from 10 am to 4 pm, Tuesday until 8 pm. The café is open from 10 am to 2 pm. Museum offices are open Monday through Friday from 9 am to 5 pm. The research library will be open Tuesday through Friday, 10 am to 4 pm, or by appointment. Fuller also extended her gratitude to all the people, including the entire community, who have been patient throughout the process. “We want to say thank you to the Island and the residents for bearing with us,” she said.